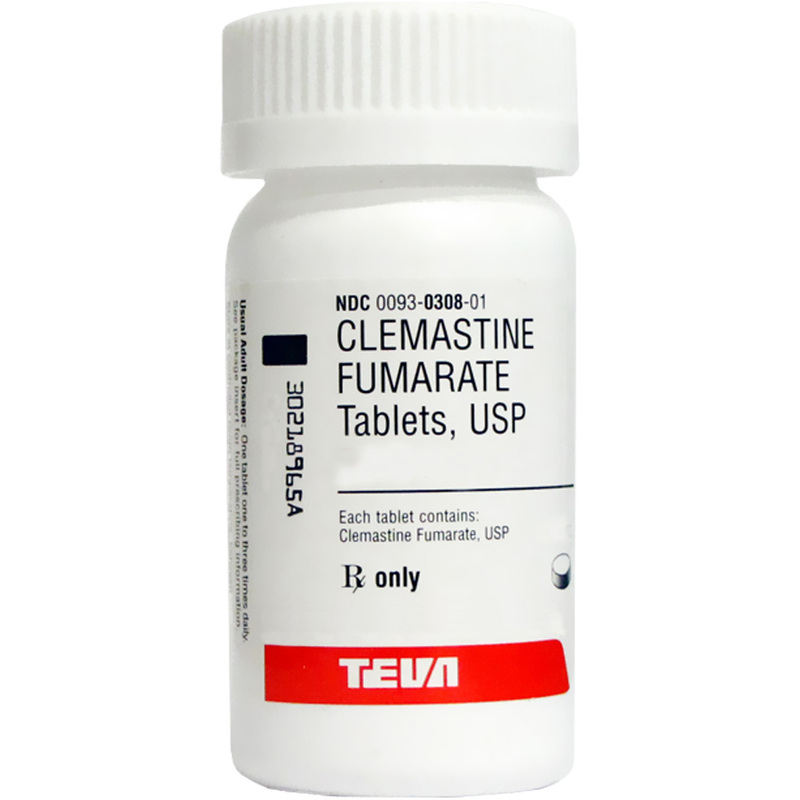 Clemastine is a prescription antihistamine medication commonly used in the treatment and prevention of allergies. Antihistamines work by blocking histamine, a substance produced during an allergic reaction or sensitivity. If your pet has been diagnosed with allergies or suffers from allergy like symptoms, your veterinarian may prescribe an antihistamine such as clemastine. This medication helps relieve the symptoms associated with allergies, and is not a treatment to eliminate them. Talk with your pet’s veterinarian before administering this medication and follow their specific recommendations for use. How it works: Clemastine is a selective histamine H1 antagonist. It binds to the histamine H1 receptor, and blocks histamine, allowing for temporary relief of allergy symptoms. Clemastine is not FDA-approved for use in animals. However, it is a commonly accepted practice for veterinarians to use this medication in dogs and cats. The usual dose in dogs is .67 - 1.34 mg every 12 hours. The usual dose in cats is .67 mg every 12 hours. View Clemastine Drug Facts Sheet. Clemastine should not be used in: This medication should not be used in animals who are allergic to it. Do not administer Clemastine to pregnant or lactating animals, or to animals with prior prostate and bladder conditions, severe cardiac failure, or glaucoma. Possible side effects: Side effects may include diarrhea, lethargy, sedation, hyperactivity, and dry mouth. If you observe any of these side effects, contact your veterinarian as soon as possible. What should I discuss with my veterinarian while considering Clemastine? Talk to your veterinarian about what tests and exams may be necessary while your pet is taking Clemastine. Also, discuss how long the treatment period will be and what type of outcome is expected. You and your veterinarian should talk about any other treatment options that are recommended for your pet. Tell your veterinarian if your pet has prostate disease, urinary obstruction, heart disease, glaucoma, or gastrointestinal obstruction, is pregnant or may be used for breeding. Notify your veterinarian of any other medications or supplements your pet is taking. Also if your pet has had any reactions to previous medications. What is the most important information I should know? Clemastine is not a cure, and symptoms will return if the Clemastine is discontinued. This medication may cause sedation. Who should not take it? Not for use in animals hypersensitive (allergic) to it. Use with caution in animals with glaucoma, enlarged prostate, severe cardiac failure, or obstruction of the urinary bladder (problems urinating), or obstruction of the pylorus (junction between the stomach and intestine). Do not use in working animals (military dogs, police dogs, seeing eye dogs, hearing dogs, etc.) as it may cause too much sedation. Clemastine may enter the milk and have adverse effects on the young. What side effects may be seen when taking Clemastine? Dogs: Side effects include dry mouth, sleepiness, sedation, or hyperexcitability. Cats: Most common side effect is diarrhea. How is it stored? Store in a tight, light-resistant, childproof container at room temperature. Keep out of reach of children and pets. What should I do if I know of or suspect there has been an overdose? If you know or suspect your pet has had an overdose, contact your veterinarian immediately. What should I avoid when giving my pet Clemastine? Consult your veterinarian before using Clemastine with vitamins and supplements, other central nervous system (CNS) depressant drugs such as barbiturates or antidepressants, monoamine oxidase inhibitors (MAOIs), such as furazolidone, selegiline (Anipryl), isoniazid, or amitraz (an ingredient in some tick collars, and in Mitaban, a treatment for mange), or flea and tick collars, since interactions may occur.